The first edition of Systems Thinking was the first book to develop a working concept of systems theory and to deal operationally with systems methodology. The author has been working for the last 5 years to incorporate parallel development in quantum theory, self-organizing systems and complexity theory, the sum of which is included in this new 2nd edition. He has tested these concepts with 200 executive MBA students, and also with Russell Ackoff, one of the founding fathers of systems thinking. Ackoff reported that it was the most comprehensive systems methodology he has seen. 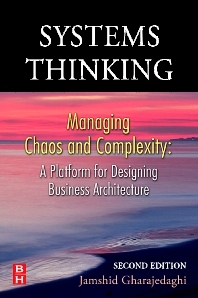 The 2nd edition features the synthesis of holistic thinking (iteration of structure, function and process), operational thinking (understanding chaos and complexity), sociocultural systems (movement toward a predefined order), and interactive design (redesigning the future and inventing ways to bring it about). Also added are the operational thinking and self-organizing aspect of sociocultural systems, with updates made to the holistic thinking and interactive design parts to incorporate recent new developments. Senior executives; Chief Information/Operating Officers and other executives charged with systems management and process improvement. Secondary market: IT/MBA students and academics.